In a divided America, they might be the last two people you'd think would reconcile their conflicting beliefs. Ted Hakey, Jr. was a former Marine living with his wife in Meriden, Conn., when he says he started to feel uneasy toward Muslims. With each story of another terrorist attack, his resentment grew, so he admits he was concerned when, in 2007, an Ahmadiyya mosque opened next door to his house, just across a small field. Ted watched his neighbors through binoculars. "I look out one day, the place is like a beehive, and there are all kinds of men coming and going, and I’m like wait a minute," he says. "I’m thinking they’re plotting. It’s such a mystery, you know? You don’t know what they’re doing in there." Ted, who was in his 40s and working at a car dealership, lived next to the mosque for years without incident, peering over from time to time. Then came Nov. 13, 2015, when terrorists killed 130 people in Paris and injured hundreds more. In Connecticut, just hours after the attack, Ted was returning home. "I had a good night, was out with friends, watched a band," he remembers. 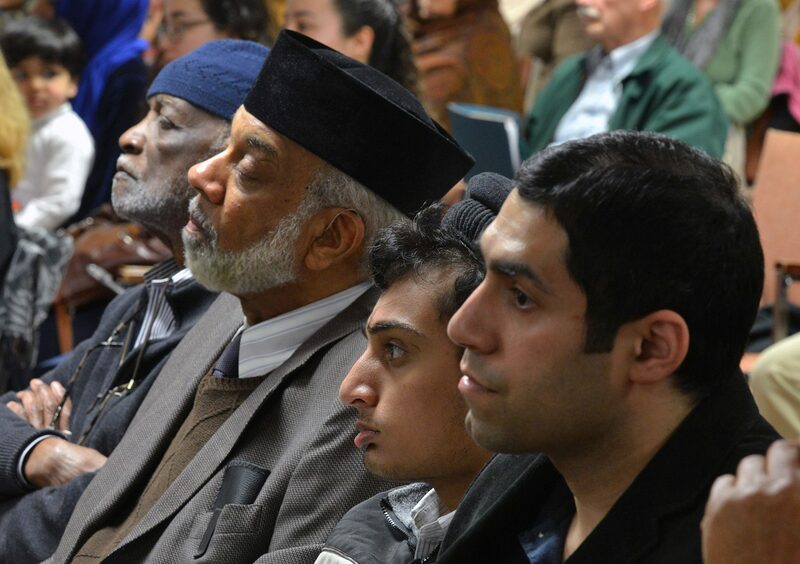 "Got out of the car, was walking in and I kind of looked over and I saw the mosque." The more he looked at it that night, the more worked up he got. He convinced himself he needed to do something to help his community. To "keep them on edge." Ted took out his rifle and pointed it at the mosque. "In case there was an extremist in there, in my drunken Jack Daniels thinking I was thinking that, oh, it’ll scare them, and they might think twice." He shot round after round in the direction of the mosque. Ted says he was aiming for the ground, but four bullets hit the mosque, which was fortunately empty. Zahir was shaken. Just a few hours before Ted took aim, Zahir and his children had been at the mosque in the room the bullets pierced. "Right through the prayer hall where the imam stands," he says. "And if I had decided to stay over for devotion, that’s where I would’ve been." Then Zahir learned the shooter was their neighbor, and the authorities showed him Ted’s Facebook posts in which he talked about killing Muslims. It disturbed Zahir that their neighbor could miss all the good they were trying to do. "Immediately we thought, where did we go wrong? If he spied on us, did he not see our blood drive sign?" Or, he wondered, the sign out front with their motto: "Love for all, hatred for none." "Then that made me think, do people only see what they want to see?" Zahir says. "And I’m thinking in my head, is this what I’m doing to him?" 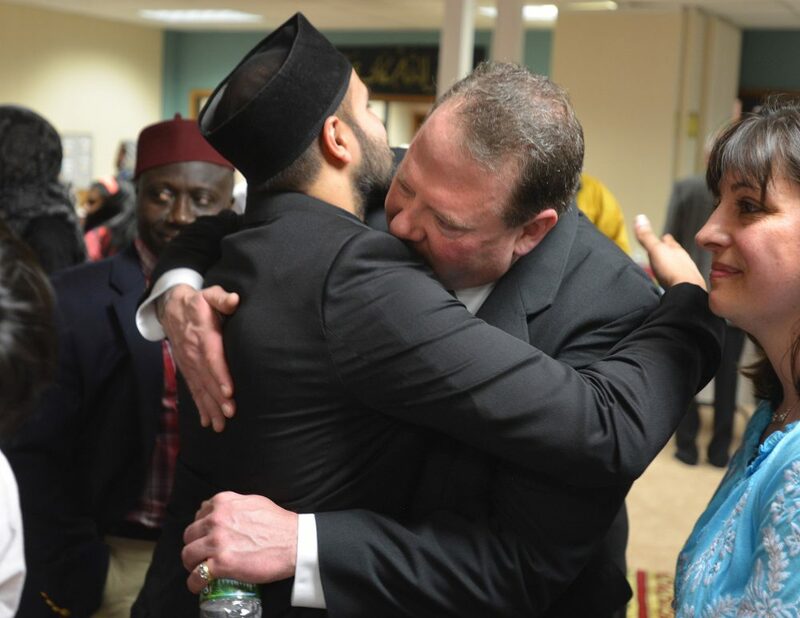 The mosque leaders decided to meet Ted Hakey. Ted, in the meantime, now more clear-headed, had come to feel terrible regret, so he met with them. Zahir remembers watching Ted enter the room where they waited for him. "The first thing he did when he came in was that he started crying," Zahir says. "This huge guy, and he has tears in his eyes. It kind of brought us to tears." They’d already planned to forgive him, but something more profound was happening. As Ted puts it, "We both were really shocked at how sincere the other side was." Ted sat down in front of Zahir, his wife, and the others, and apologized. As he did, the distrust he had for these strangers disappeared. "You could see he was a little uncomfortable, but he was also very sorry," Zahir says. "He’s not a bad guy." Then, Zahir told Ted about Islam, and Ted started asking questions. Before long, the apology had turned into a respectful conversation. "They actually were doing more against extremism than I was," Ted says. "I just realized all the misconceptions I had about Islam were wrong, because I didn’t know any actual Muslims." The next week, the congregation’s leader invited Ted to visit the mosque. In the prayer hall still marked by his bullets Ted apologized, and in front of everyone the leaders hugged him. When it came time for prayer, Ted turned to Zahir. "He just said, 'I want to pray with you,'" Zahir says. "I said, 'Follow me,' and then we bowed down. That’s when he became my brother." It was the beginning of a real friendship. Ted brought his friends to the mosque for interfaith events, and mosque members showed up at Ted’s sentencing to ask for leniency. 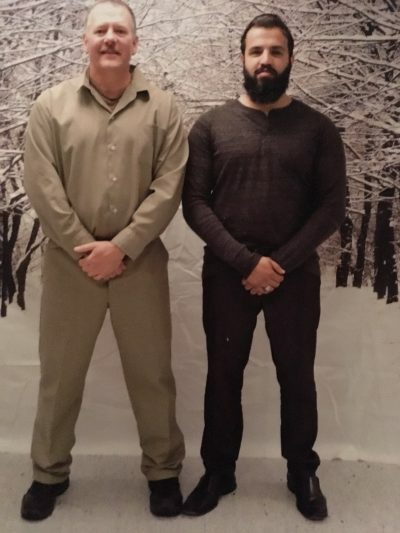 Later, when Ted was serving time, Zahir regularly visited him in prison. They still hang out as friends today. Ted says if Zahir hadn’t been so kind, his life would look very different. "None of my attitude would have changed," Ted says. "I would still have the same beliefs I always did. The way they responded to this is what changed me." Ted pleaded guilty to intentionally damaging religious property, a hate crime. Now he's out of prison and on a mission to reach people who still learn about Islam the way he once did: through negative Facebook posts. "They would say, you know, that the Quran says you must kill Christians and Jews and things like that, and I believed it," Ted says. Now when he sees a post like that, which is almost every day, he jumps into the comments section and defends what he used to hate. "I’ve had hundreds of conversations on Facebook and arguments with people, and they’re afraid that ‘oh no, they’ll chop off my head’ and stuff, and I’m like, ‘I’m telling you now, if they didn’t chop my head off, I think you’re good.’ I just want to tell people to think for themselves." Ted’s gotten in the habit of tagging Zahir, so he can chime in, too, and suddenly, people who have never met a Muslim are going back and forth with one about how to interpret the Quran. Ted and Zahir are talking across divides that are ripping a lot of the country apart. What they’re doing might look small, but Zahir sees something bigger. It’s “a miracle of biblical proportions,” he says. Find Kind World on Facebook or Twitter, or email kindworld@wbur.org to share your story. You can also sign up for Kind World's newsletter and subscribe to the podcast. This segment aired on June 23, 2017. 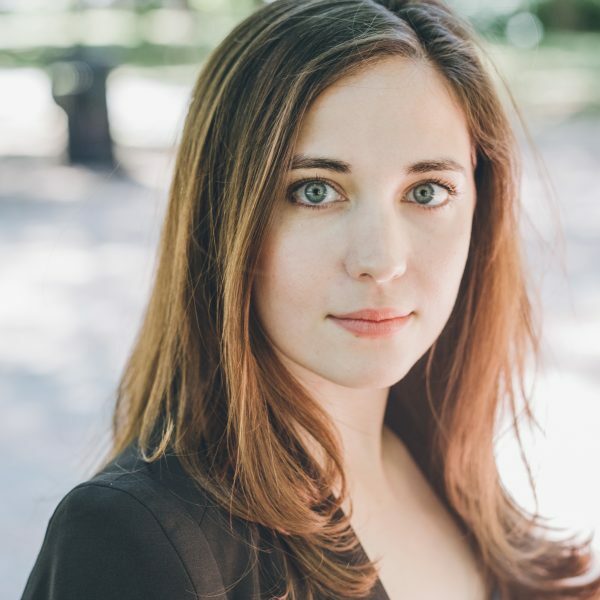 Erika Lantz was a producer in WBUR's iLab, where she led the radio series/podcast Kind World.